All that remains of a legendary masquerade ball from the Eve of St. Levantius; A noble, boyar vampire tryst, where the dark patricians reveled in a night of pure sensuality. 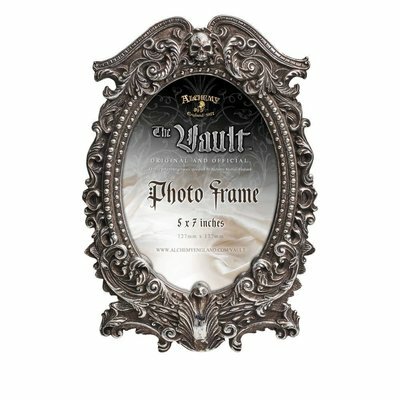 Cast resin photo frame painted silver metallic and darkened to appear antique. Exquisite Rococo detailing. A stand hinges out behind the frame. Approximate Dimensions: Width 6.57" x Height 9.25" x Depth 0.79"